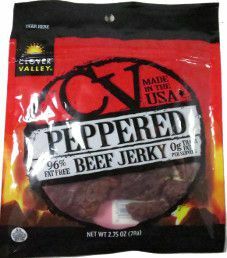 The Clover Valley jerky brand name is distributed by Dolgencorp LLC, based out of Goodlettsville, Tennessee. 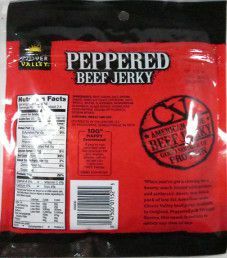 This jerky is actually manufactured by the very large private labeler Marfood USA located in Taylor, Michigan. 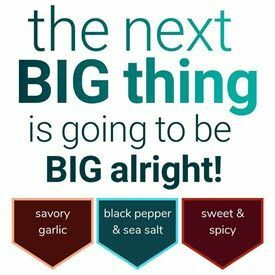 They are most likely in the top 5 jerky makers in North America for sales. That technically makes this a stock recipe. The beef used is not guaranteed to be free of growth hormones or additional antibiotics. Also, the beef is not guaranteed to have at least partial free range access to graze on grass. The beef may also be chopped and formed, which is not healthy. As a result, the highest ingredient rating that can be awarded is a Fair (4/10) rating. The liquid marinade is just plain old water. There is a soy sauce used, but it is in powdered form. The only healthy ingredient listed is black pepper, which some people call the King of Spices. The vague term flavorings is used, which could include both healthy and unhealthy ingredients. The sugar level is sort of high at around 5 grams of sugar per 28 grams of jerky. Our preference is 3 grams of sugar or less. The salt level is unbelievably high at 690mg of salt per 28 grams of jerky. Our preference is a maximum of 350mg of salt or less. This jerky uses unhealthy sodium nitrate as a preservative. Also used is sodium erythorbate, which is no better. Disappointingly, this jerky uses the unhealthy flavor enhancer monosodium glutamate (MSG) outright. Even worse, the highly processed flavor enhancer hydrolyzed corn protein is also used. These strips are rather small, and sliced to a medium thickness. 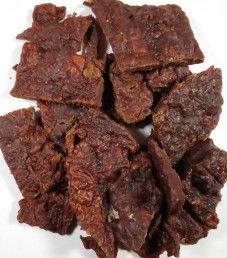 The texture is soft and tender, which does result in jerky that is easy to chew. There is no natural grain to tear these strips. It may have a chopped and formed texture, or something similar with a chunked and formed texture. There are no visible signs of fat, and handling this jerky leaves no oily residue on your fingers. The first taste detected is an unnatural beef flavor, which tastes processed. This flavor has a high content of salt, which, when eaten, makes it taste too salty. There is a moderate sweetness, and a mild soy flavor. As for the peppered flavor, it is light at best. The MSG and hydrolyzed corn protein do enhance the overall flavor, but the processed beef flavor is just too strong to overcome. This 2.75 ounce/79 gram bag of jerky cost $3.50. That works out to $1.27 an ounce, which rates as a very cheap price. Despite being such a cheap price, you could do much better from both a taste and health perspective. This is a standard sized resealable bag. Everything is imprinted directly on the bag, both of the front and back. The Clover Valley logo is half of a sun rising over the horizon. Some facts printed on this bag are “Made in the USA”, “96% Fat Free”, and “0g Trans Fat per Serving”. All bag categories have been covered. A decent blurb is printed about Clover Valley printed on the back. There is a 100% satisfaction guaranteed policy offered. Admirably, there is a toll free phone number provided for customer inquiries. Smells like a bag of farts, and taste like a treat my dog would eat. Garbage, send me you address and I will ship you some real jerky made with Jerky Gold Marinade.